"Jasseron" is the title of a duet between Emily Loizeau and Franck Monnet from Emily's debut album L'autre bout du monde. The contrast in this pullover between dark and light colors and between feminine details and casual styling nicely mirrors the contrast between a man whose thoughts are of love after death and a woman who would prefer perhaps a slightly less morbid view of their love. 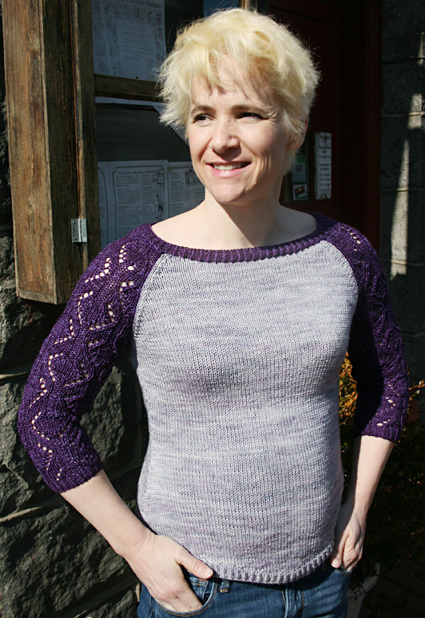 The sweater is worked in pieces from the bottom up, then seamed before adding the twisted rib ballet neckline. 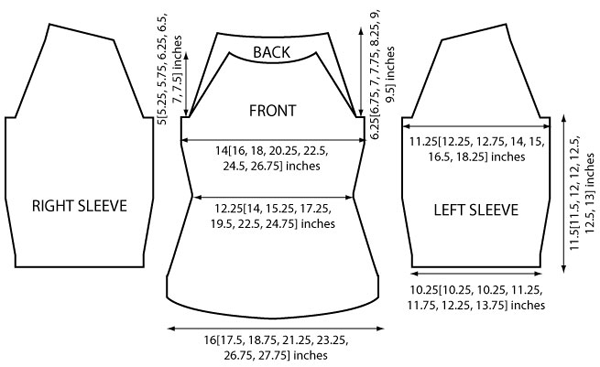 Short row shaping gives the front and back hems their curves and the neckline its gentle slope to the shoulders. The rippling ribbons of lace on the sleeves can easily be substituted with your favorite lace pattern as long as the gauge is the same. This design lends itself readily to either hand-painted or solid colorways, contrasting or complementary colors, luxury or toss-in-the-wash yarns. The possibilities are endless! A cable cast on is recommended for the body and sleeves. Please read all directions carefully before beginning. Row 1 [RS]: *K1tbl, p1; rep from * to end. Row 2 [WS]: *K1, p1tbl; rep from * to end. Rnd 1: *K1tbl, p1; rep from * to end of rnd. Row 1: P2, k2, *k2, p1, k2tog, yo, k1, p2, k1, yo, ssk, p1, k2; rep from * to last 4 sts, k2, p2. Row 2: P1, k2, p1, *p1, (k2, p3) twice, k2, p1; rep from * to last 4 sts, p1, k2, p1. Row 3: Yo, ssk, p1, k1, *k1, p1, k2tog, yo, k2, p2, k2, yo, ssk, p1, k1; rep from * to last 4 sts, k1, p1, k2tog, yo. Row 4: P2, k2, *k2, (p4, k2) twice; rep from * to last 4 sts, k2, p2. Row 5: K1, yo, ssk, p1, *p1, k2tog, yo, k3, p2, k3, yo, ssk, p1; rep from * to last 4 sts, p1, k2tog, yo, k1. Row 6: P3, k1, *k1, p5, k2, p5, k1; rep from * to last 4 sts, k1, p3. Row 7: K3, p1, *p1, k3, k2tog, yo, p2, yo, ssk, k3, p1; rep from * to last 4 sts, p1, k3. Row 8: P3, k1, *k1, p4, k4, p4, k1; rep from * to last 4 sts, k1, p3. Row 9: K3, p1, *p1, k2, k2tog, yo, p1, k2, p1, yo, ssk, k2, p1; rep from * to last 4 sts, p1, k3. Row 10: P3, k1, *k1, p3, k2, p2, k2, p3, k1; rep from * to last 4 sts, k1, p3. Row 11: Yo, ssk, k1, p1, *p1, k1, k2tog, yo, p1, k4, p1, yo, ssk, k1, p1; rep from * to last 4 sts, p1, k1, k2tog, yo. Row 12: K1, p2, k1, *k1, p2, k2, p4, k2, p2, k1; rep from * to last 4 sts, k1, p2, k1. Row 13: P1, yo, ssk, p1, *p1, k2tog, yo, p1, k6, p1, yo, ssk, p1; rep from * to last 4 sts, p1, k2tog, yo, p1. Row 14: K2, p1, k1, *k1, p1, k3, p4, k3, p1, k1; rep from * to last 4 sts, k1, p1, k2. Row 15: K2tog, yo, k1, p1, *p1, k1, yo, ssk, p1, k4, p1, k2tog, yo, k1, p1; rep from * to last 4 sts, p1, k1, yo, ssk. Row 16: P3, k1, *k1, p3, k2, p2, k2, p3, k1; rep from * to last 4 sts, k1, p3. Row 17: K3, p1, *p1, k2, yo, ssk, p1, k2, p1, k2tog, yo, k2, p1; rep from * to last 4 sts, p1, k3. Row 18: P3, k1, *k1, p4, k4, p4, k1; rep from * to last 4 sts, k1, p3. Row 19: K3, p1, *p1, k3, yo, ssk, p2, k2tog, yo, k3, p1; rep from * to last 4 sts, p1, k3. Row 20: P3, k1, *k1, p5, k2, p5, k1; rep from * to last 4 sts, k1, p3. Row 21: K1, k2tog, yo, p1, *p1, yo, ssk, k3, p2, k3, k2tog, yo, p1; rep from * to last 4 sts, p1, yo, ssk, k1. Row 22: P2, k2, *k2, p4, k2, p4, k2; rep from * to last 4 sts, k2, p2. Row 23: K2tog, yo, p1, k1, *k1, p1, yo, ssk, k2, p2, k2, k2tog, yo, p1, k1; rep from * to last 4 sts, k1, p1, yo, ssk. Row 24: P1, k2, p1, *p1, (k2, p3) twice, k2, p1; rep from * to last 4 sts, p1, k2, p1. Row 25: P2, k2, *k2, p1, yo, ssk, k1, p2, k1, k2tog, yo, p1, k2; rep from * to last 4 sts, k2, p2. Row 26: K2, p2, *p2, (k2, p2) 3 times; rep from * to last 4 sts, p2, k2. Row 27: P1, k3, *k3, p1, yo, ssk, p2, k2tog, yo, p1, k3; rep from * to last 4 sts, k3, p1. Row 28: K2, p2, *p2, k3, p1, k2, p1, k3, p2; rep from * to last 4 sts, p2, k2. Rep Rows 1-28 for patt. Using US #5/3.75mm needle and MC, CO 84[92, 98, 112, 122, 140, 146] sts. Work in 1x1 Twisted Rib for 1[1, 1, 1.25, 1.25, 1.5, 1.5] inches, ending after a WS row. Change to US #6/4mm needle. Row 1 [RS]: K45[49, 52, 60, 65, 75, 79], w&t. Row 2 [WS]: P6[6, 6, 8, 8, 10, 12], w&t. Row 3 [RS]: Knit to wrapped st, knit wrap with wrapped st, k4[4, 5, 6, 7, 7, 8], w&t. Row 4 [WS]: Purl to wrapped st, purl wrap with wrapped st, p4[4, 5, 6, 7, 7, 8], w&t. Rep last 2 rows 5[6, 7, 6, 6, 7, 6] times more. Work 2 rows in St st, working last two wraps with the wrapped sts. Work even in St st (if necessary) until piece measures 1.5[2, 2, 1.75, 2, 2, 3.25] inches from cast-on (measured along edge), ending after a WS row. Dec Row [RS]: K1, k2tog, knit to last 3 sts, ssk, k1. 2 sts dec'd. Work 3 rows even in St st.
Rep last 4 rows 9[8, 8, 10, 9, 10, 7] times more. 64[74, 80, 90, 102, 118, 130] sts. Work even until piece measures 7.75[7.75, 7.75, 8.75, 8.5, 9, 9] inches from cast-on (measured along edge), ending after a WS row. Inc Row [RS]: K1, M1R, knit to last st, M1L, k1. 2 sts inc'd. Work 5[5, 3, 3, 3, 5, 5] rows even in St st.
Rep last 6[6, 4, 4, 4, 6, 6] rows 3[3, 5, 6, 6, 3, 3] times more, then rep Inc Row once more. 74[84, 94, 106, 118, 128, 140] sts. Work even in St st until piece measures 13.5[14, 14.75, 15.5, 15.5, 15.75, 15.75] inches from cast-on (measured along edge), ending after a WS row. Next row [RS]: K2, k2tog, knit to last 4 sts, ssk, k2. 2 sts dec'd. Rep last 2 rows 11[12, 13, 15, 16, 18, 19] more times. 42[48, 54, 60, 66, 70, 78] sts. Next row [RS]: K2, k2tog, k8[8, 9, 10, 10, 11, 11], w&t. Next row: K2, k2tog, k5[5, 6, 7, 7, 8, 8], w&t. Next row: K2, k2tog, k2[2, 3, 4, 4, 5, 5], w&t. Next row: K2, k2tog, knit to last 4 sts working wraps with wrapped sts, ssk, k2. 37[43, 49, 55, 61, 65, 73] sts. Next row: P11[11, 12, 13, 13, 14, 14], w&t. Next row: Knit to last 4 sts, ssk, k2. Next row: P8[8, 9, 10, 10, 11, 11], w&t. Next row: P4[4, 5, 6, 6, 7, 7], w&t. Next row: Purl across, working wraps with wrapped sts. 34[40, 46, 52, 58, 62, 70] sts. Work as for FRONT to **. Row 1 [RS]: K2, k2tog, knit to last 4 sts, ssk, k2. 2 sts dec'd. Rep last 4 rows 7[8, 8, 9, 10, 11, 12] more times, then rep Rows 1-2, 0[0, 1, 1, 1, 1, 1] time more. 50[56, 62, 70, 76, 82, 90] sts. Next row [RS]: K2, k2tog, k9[10, -, -, -, -, -], w&t. Next row: K9[10, -, -, -, -, -], w&t. Next row: K2, k2tog, k2[3, -, -, -, -, -], w&t. Next row: K2, k2tog, knit to last 4 sts working wraps with wrapped sts, ssk, k2. Next row: P12[13, -, -, -, -, -], w&t. Next row: P9[10, -, -, -, -, -], w&t. Next row: P5[6, -, -, -, -, -], w&t. Next row: Purl across, working wraps with wrapped sts. 44[50, -, -, -, -, -] sts. Next row [RS]: K-[-, 15, 16, 17, 18, 19], w&t. Next row: K2, k2tog, k-[-, 7, 8, 9, 10, 11], w&t. Next row: K-[-, 6, 7, 8, 9, 10], w&t. Next row: K2, k2tog, knit to end, working wraps with wrapped sts. Next row: P-[-, 15, 16, 17, 18, 19], w&t. Next row: P-[-, 8, 9, 10, 11, 12], w&t. Next row: P-[-, 5, 6, 7, 8, 9], w&t. Next row: Purl across, working wraps with wrapped sts. -[-, 58, 66, 72, 78, 86] sts. Using US #5/3.75mm needles and CC, CO 44[44, 44, 48, 50, 52, 58] sts. 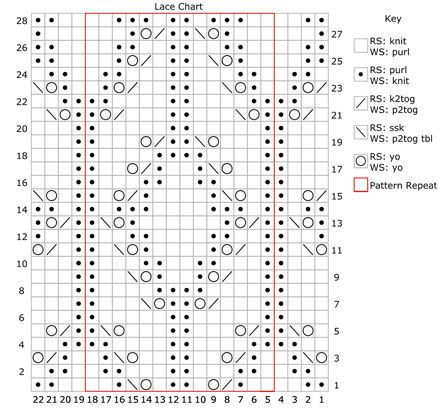 Row 1 [RS]: K1, starting with st 5[5, 5, 3, 2, 1, 5] work lace chart to last st (ending with st 18[18, 18, 20, 21, 22, 18] of chart), k1. Cont in lace patt with 1 st in St st at each end of each row for 9[9, 9, 7, 7, 5, 5] rows more. Note: Work increased sts into lace patt when possible, being careful to make sure stitch count stays correct. Inc row [RS]: K1, M1R, work lace patt to las st, M1L, k1. 2 sts inc'd. Work even in patt for 9[9, 9, 7, 7, 5, 5] rows. Rep last 10[10, 10, 8, 8, 6, 6] rows 1[3, 4, 5, 6, 8, 9] times more. 48[52, 54, 60, 64, 70, 78] sts. Work even in patt until piece measures 11.5[11.5, 12, 12, 12.5, 12.5, 13] inches from cast-on edge, ending after a WS row. BO 4[5, 6, 7, 9, 10, 11] sts at beg of the next 2 rows. 40[42, 42, 46, 46, 50, 56] sts. Row 1 [RS]: K2, k2tog, patt to last 4 sts, ssk, k2. 2 sts dec'd. Row 2 [WS]: P2, patt to last 2 sts, p2. Row 3 [RS]: K2, patt to last 2 sts, k2. Row 4 [WS]: P2, patt to last 2 sts, p2. Rep last 4 rows 7[7, 8, 9, 9, 10, 11] more times, then rep Rows 1-2, 0[1, 0, 0, 0, 0, 0] time more. 24[24, 24, 26, 26, 28, 32] sts. Row 1 [RS]: K2, k2tog 1[0, 1, 1, 1, 1, 1] time, patt 12[14, 13, 14, 16, 17, 18], w&t. Row 2 [WS]: Patt to last 2 sts, p2. Row 3: K2, k2tog 0[1, 0, 0, 0, 0, 0] time, patt 9[8, 10, 11, 12, 13, 14], w&t. Row 4: Patt to last 2 sts, p2. Row 5: K2, k2tog 1[0, 1, 1, 1, 1, 1] time, patt 4[5, 5, 6, 7, 8, 9], w&t. Row 6: Patt to last 2 sts, p2. 22[23, 22, 24, 24, 26, 30] sts. Row 7: K2, patt to last 2 sts (working wraps with wrapped sts), k2. Row 8: P2, patt to last 2 sts, p2. Row 7: K2, k2tog, patt 2 sts, w&t. Row 8: Patt to last 2 sts, p2. Row 9: K2, patt to last 2 sts (working wraps with wrapped sts), k2. 22 sts. Row 10: P2, patt to last 2 sts, p2. Row 7: K2, patt -[-, 3, 4, -, -, -] sts, w&t. Row 9: K2, k2tog, patt to last 2 sts (working wraps with wrapped sts), k2. -[-, 21, 23, -, -, -] sts. Row 7: K2, patt -[-, -, -, 5, 6, -] sts, w&t. Row 9: K2, k2tog, work -[-, -, -, 2, 3, -] sts, w&t. Row 10: Patt to last 2 sts, p2. Row 11: K2, patt to last 2 sts (working wraps with wrapped sts), k2. -[-, -, -, 23, 25, -] sts. Row 12: P2, patt to last 2 sts, p2. Row 7: K2, patt 7 sts, w&t. Row 9: K2, k2tog, patt 4 sts, w&t. 1 st dec'd. Row 11: K2, work 3 sts, w&t. Row 12: Patt to last 2 sts, p2. Row 13: K2, k2tog, patt to last 2 sts (working wraps with wrapped sts), k2. 28 sts. Row 14: P2, patt to last 2 sts, p2. Work as for Left Sleeve to **, ending with a WS row. Row 1 [RS]: K2, patt to last 4[2, 4, 4, 4, 4, 4] sts, ssk 1[0, 1, 1, 1, 1, 1] time, k2. 23[24, 23, 25, 25, 27, 31] sts. Row 2 [WS]: P2, patt 12[14, 13, 14, 16, 17, 18], w&t. Row 3: Patt to last 2[4, 2, 2, 2, 2, 2] sts, ssk 0[1, 0, 0, 0, 0, 0] time, k2. 0[1, 0, 0, 0, 0, 0] st dec'd. Row 4: P2, patt 9[8, 10, 11, 12, 13, 14], w&t. Row 5: Patt to last 4[2, 4, 4, 4, 4, 4] sts, ssk 1[0, 1, 1, 1, 1, 1] time, k2. Row 6: P2, patt 4[5, 5, 6, 7, 8, 9], w&t. Row 7: Patt to last 2 sts, k2. Row 8: P2, patt to last 2 sts (working wraps with wrapped sts), p2. Row 7: Patt to last 4 sts, ssk, k2. Row 8: P2, patt 4 sts, w&t. Row 9: Patt to last 2 sts, k2. Row 10: P2, patt to last 2 sts (working wraps with wrapped sts), p2. 22 sts. Row 8: P2, patt -[-, 3, 4, -, -, -] sts, w&t. Row 9: Patt to last 4 sts, ssk, k2. Row 10: P2, patt to last 2 sts (working wraps with wrapped sts), p2. -[-, 21, 23, -, -, -] sts. Row 8: P2, patt -[-, -, -, 5, 6, -] sts, w&t. Row 10: P2, patt -[-, -, -, 2, 3, -] sts, w&t. Row 11: Patt to last 2 sts, k2. Row 12: P2, patt to last 2 sts (working wraps with wrapped sts), p2. -[-, -, -, 23, 25, -] sts. Row 8: P2, patt 7 sts, w&t. Row 10: P2, patt 4 sts, w&t. Row 12: P2, patt 3 sts, w&t. Row 13: Patt to last 4 sts, ssk, k2. Row 14: P2, patt to last 2 sts (working wraps with wrapped sts), p2. 28 sts. Block pieces to measurements. Sew sleeves to front and back along raglan edges. Sew side and sleeve seams. Using US #5/3.75mm circular needles and CC, beg at seam of back left raglan seam, pick up and k20[20, 19, 21, 21, 23, 26] sts across left sleeve, approx. 3 sts for every 4 bound off sts across front neck, 20[20, 19, 21, 21, 23, 26] sts across right sleeve, and approx. 3 sts for every 4 bound off sts across Back neck, making sure to end with an even number of sts on needle. Join to work in the rnd and pm for beg of rnd. Work 3 rnds in 1x1 Twisted Rib. Switch to US #4/3.5mm circular needles and work 3[3, 3, 4, 4, 5, 5] more rnds in patt. Steam block collar if desired and weave in all ends. Becky Wolf is a nascent designer who spends her free time learning French, putzing around with LEGO bits and pieces, and watching H. Jon Benjamin shows. 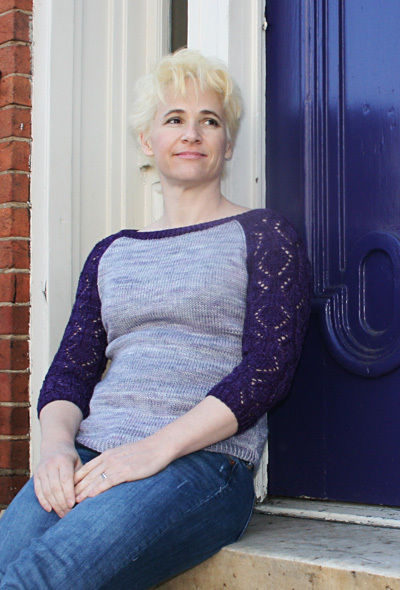 Her designs have been published in Silver Screen Knits, Volumes One and Two by Kathleen Lawton-Trask. 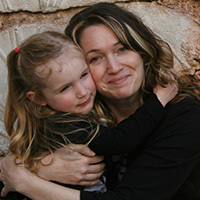 Becky lives in Northern Virginia with her husband and daughter. She can be found on her website, beckywolfdesigns.com, and on Ravelry as mewmewbecky. On weekends, she can be found in her pajamas.